The Mithran babes just wanted a day at the beach… but alas, it was not meant to be! ATTACK OF THE 50 FOOT BOMB! Anyway, I’m adding a fan run site for the work of Akihiko Yoshida to my links to the right. Or you can click here to see it for all I care. Final Fantasy XII was meh, but Vagrant Story and Final Fantasy Tactics remain gaming gold to this day. Vagrant Story in particular remains a powerful influence on my writing. PS You can also check out some of the amazing scores for these games by Hitoshi Sakamoto. Here’s one for Vagrant Story, and another for Final Fantasy Tactics. Somedays I do miss my Ironbreaker, Helmnir. I used to play Final Fantasy XI, World of Warcraft and Warhammer Online. I thought I would miss them more than I do, but every once in a while nostalgia does rear its head. One of the things that not only MMORPGs but games in general are doing more and more these days is coming out with additional content over time. When I got Final Fantasy XI, I was fortunate that it had been out in Japan for some time, so a lot of early bugs and new content was added long before I ever got the game in the first place. This made the experience much more enjoyable. World of Warcraft did a good job of coming out with just enough early content to occupy players before PvP really kicked in. Warhammer Online however, failed to do all this at first. They focused too heavily on fighting with very little PvE content. People need a break from smashing people, to really build up and discover the world, or create things. Combat – It should be fast pace with enough abilities to create interesting strategies. It should be reasonably balanced, so that one class has some abilities and tactics they can use to defeat other classes. Environment – This should factor into everything. Cover should shield players from projectiles, sand should slow people down, as should rain. Snow should make climbing difficult. The environment should explain the monsters you face and the items you get and the local economies. It should make sense. Crafting/Economics – People need to feel that nothing is unobtainable, but at the same time a careful balance of work and effort should be applied to earn anything. I’ll talk more about this in a moment. Adventure – For some reason, a lot of MMORPGs don’t focus more on the actual adventure aspects as I feel they should. Exploring a world, facing traps and worldly dangers. Games like Fallout are big on this. They are an adventure! Interaction – The proper extent to which people can communicate, trade, help or murder you. I have to give a warning that I don’t mention World of Warcraft very much in the following entry. The thing about WoW is that it’s great, all around game. I feel that certain aspects of the game are better represented in other games, like WAR and FFXI, but in general WoW tends to be the superior game because it’s a complete package of all these things. Combat is actually the easiest thing to talk about. So much time is spent trying to come up with an interesting and intuitive combat system that combines fast pace with a wide list of abilities. 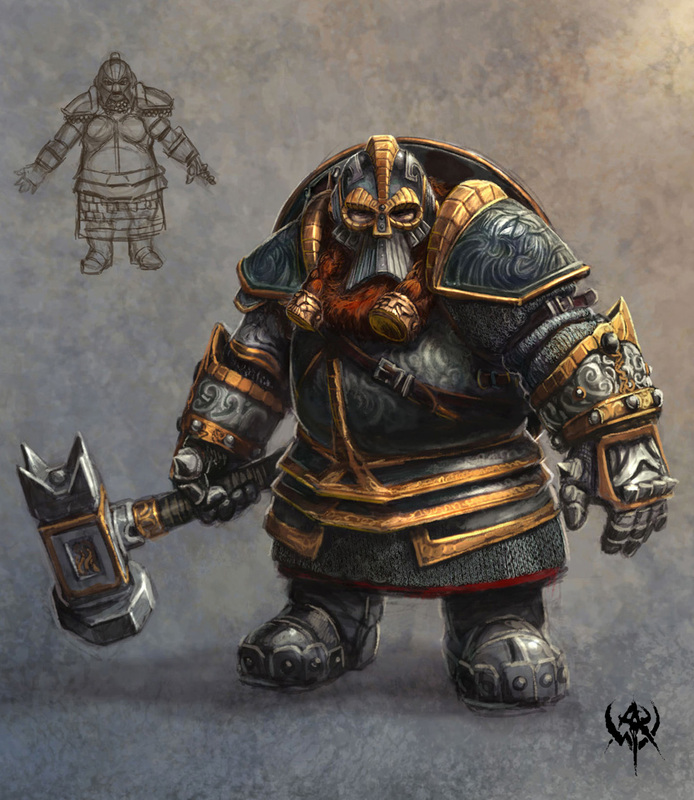 In this, I’d have to say that Warhammer Online actually does the best job, if for no other reason than the developers spent so much time developing an expansive set of abilities and techniques each class can use against one another. Besides damage, the actual effects of the abilities can change the focus of combat. There was one combat instance with all these lava pits, and I loved using my Ironbreaker‘s shield bash to send opponents flying into them. Careful position could prevent this, but these abilities greatly figured into the strategies we would use to defend allies, survive, take down opponents and prevent them from accomplishing objectives. It was very much a thinking man’s game, at least until the sheer number of opponents mobbed it. Environment however, is huge. Colossal even. My favorite gaming moments scenes have come from Final Fantasy XI, when I’m riding through a desert and I can’t help but stop and admire the moon in the distance or the mountain ranges. When I pass through the cities and I see these simple details like chairs and mugs of ale, food and bags of grain. The world really comes alive not when environments are clean and organized but when they’re dirty and messy. In some ways, we kind of owe it to World of Warcraft for adding things like swimming, which further expanded how large the world was. Crafting and economics vary. I feel that Final Fantasy XI did the best job of this because of the requirements and ingredients, the work that had to go into it. There were recipes to learn and hidden underneath it all was a crazy feng-shui system, where the day, weather and direction you were facing actually chance the results of your effort. For better or worse, Final Fantasy XI operated on a free market system economy, which no one minded until the prices of goods were undercut by sellers desperate to offload their goods at the Auction Houses. Complaining about prices went both ways, but people could also go after the goods they wanted themselves in the world. The downside was how often some of these things were not fun to do. For example, mining or logging wasn’t great because of the cost of getting fresh tools each time your existing tool broke and then finding a ore vein or tree to cut into. There was no mini-game involved, it was just a random chance as to whether you’d get the supplies you needed or not. Game developers struggle to find the perfect balance of incentive versus effort. Success should feel rewarding and hard earned, but at the same time shouldn’t feel time consuming or frustrating. This system was a touch different from other MMORPGs. I didn’t feel like money mattered much in WAR or WoW. WAR focused more on kill based rewards and points you can earn. FFXI did something like this in a political sense but it was basically just icing on the cake. I honestly cannot say what the best approach is, but there are merits in both methods. If a player wants to work to earn better equipment through crafting and odd jobs, they should be allowed too. If they just want to have the basic gear given to them by the military, they should be allowed too.